On Thursday night the sky was clear, the moon was full and the mosquitoes were swarming. 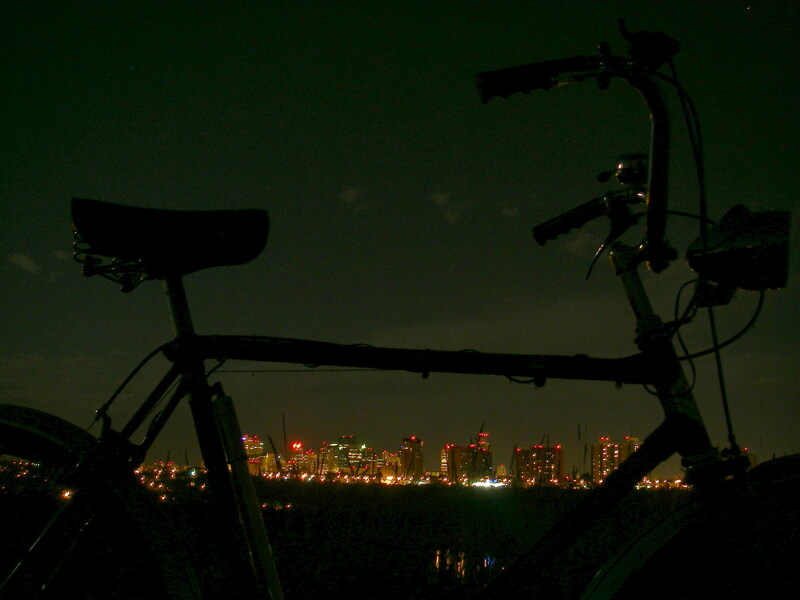 A perfect night for a midnight bike ride. Well, almost perfect. 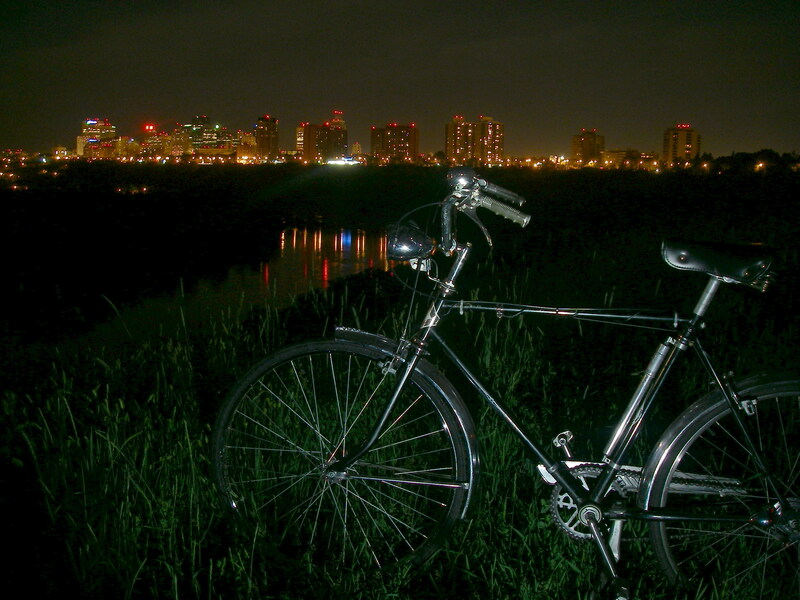 I took my 46 year old CCM bike, my 20 year old thrift store tripod and my 5 year old 6MP digital camera. Of those three items the camera is the most obsolete. I also brought mosquito repellant. Did I mention the mosquitoes? I struck out along the vacant residential streets towards a local park that is my favourite for taking photos. 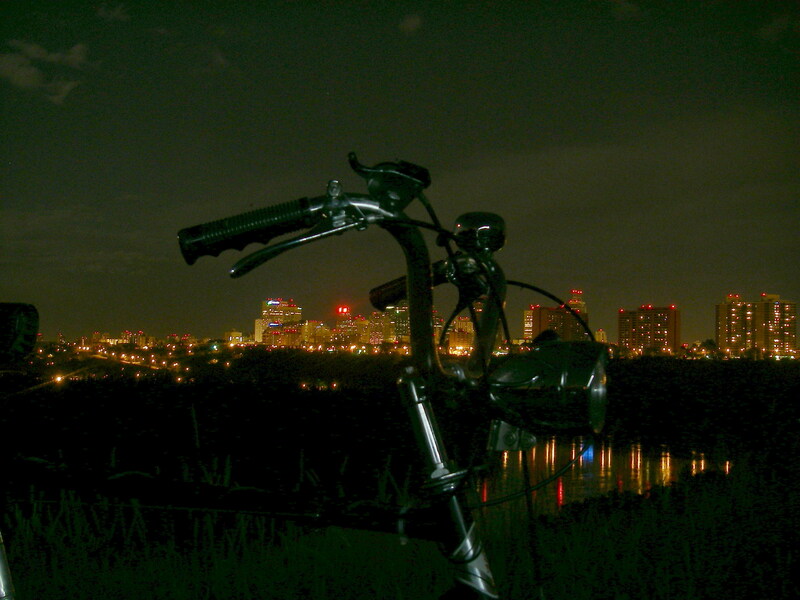 It sits atop a high bluff overlooking the river valley and the skyline of downtown Edmonton. 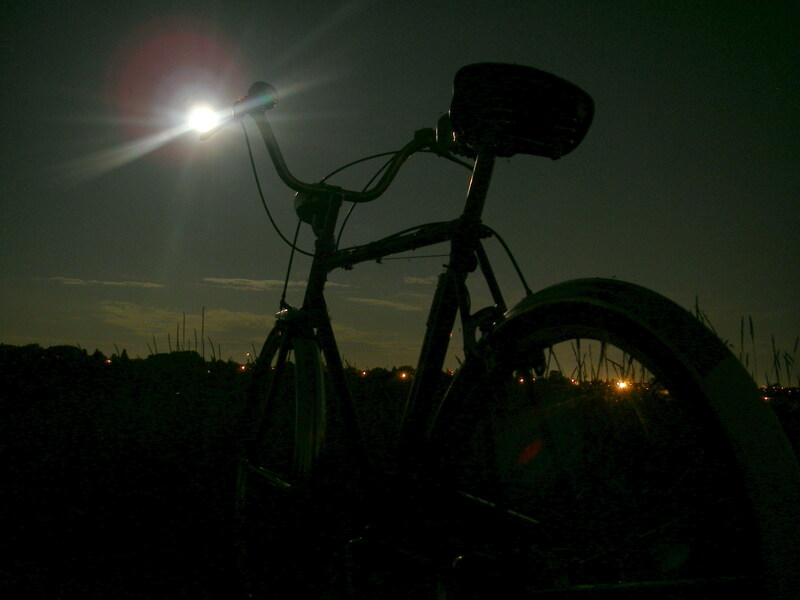 Riding the CCM at night is a lot of fun, silent and smooth, with the faint ticking of the SA hub when coasting. The bike has a hub generator and lights but as I’ve never taken the time to get them working I was limited to my helmet lights. 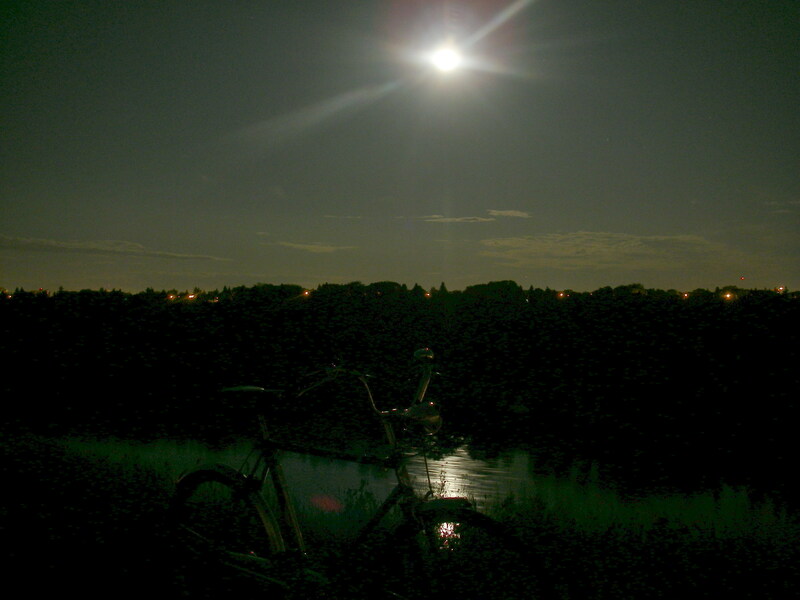 I played the beam from my headlamp over the rows of quiet upscale houses fronting on the river valley as I glided past. The street reaches a dead-end at the park entrance. 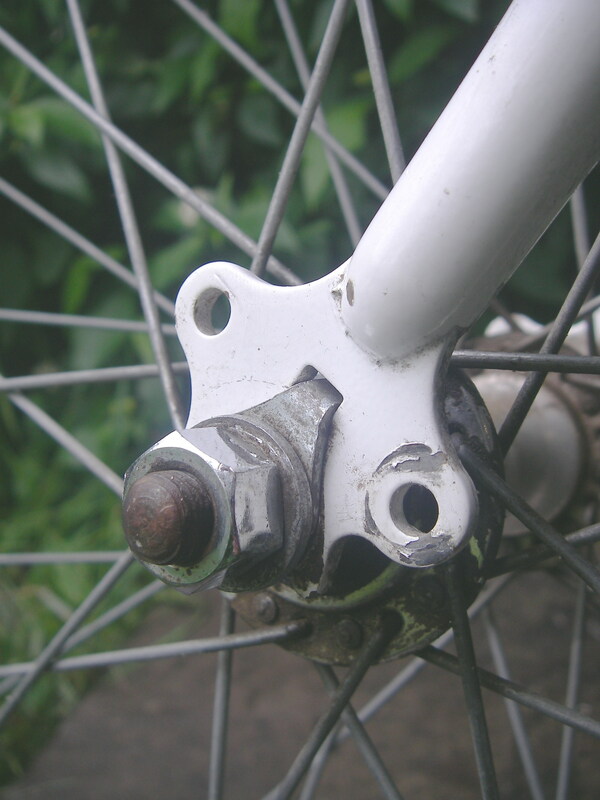 I hoisted my bike over the shin-level rusty chain, catching a pedal as I did so, and cringing a little at the noise it made. There are a couple of orange street lights near the entrance casting dingy pools of light. I headed past them to the deeper, darker end of the park. I stopped near a bench alongside the the edge of the bluff. 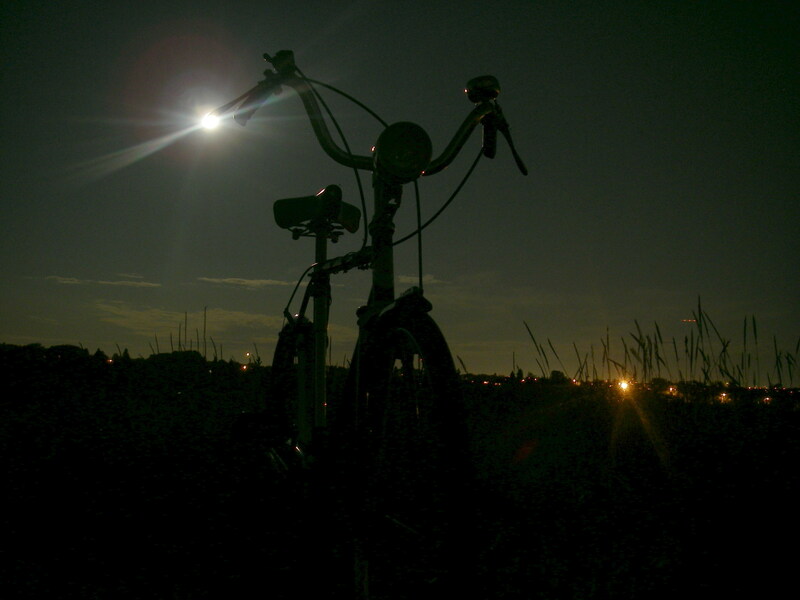 The moonlight shone brightly over the river casting stark shadows into the field behind me. Looking over the edge I could see the path of moonlight illuminating the flowing river far below and I stood for moment in silent appreciation. Then the mosquitoes engulfed me. Gahhh! I rapidly applied some mosquito repellant and got to work. I have no knowledge of photography and my point-and-shoot camera reflects that. It has a couple of night-time preset modes that I thought might be useful. After a few quick test shots I settled on using the Fireworks mode. It has a longish exposure but didn’t make the resulting pictures look like daylight. A few other technical problems immediately presented themselves. The screen on my camera didn’t show any detail in the dark and I couldn’t tell if I was framing the shots correctly. Holding my helmet in my hand I used it to illuminate the bike enough that I could see an image on the camera screen. Each time I did this I also illuminated the teeming hordes of mosquitoes around me. That was a little scary. Pressing on with the photoshoot, I took some photos just by moonlight and some by the light of my headlamp. Occasionally I ran about ten feet way from the camera to provide a more diffuse light. When I was finally done and was packing away the tripod, two cyclists with their lights ablaze with rolled past on the riverside trail hundreds of feet below me. Yes, it was a nice night for riding and time to be on my way. Over the next couple of days I played with my rather limited software (appropriate to my rather limited camera) resulting in a handful of what I think are decent photos. Some of them look more like dusk than midnight but I like them anyway. It almost makes me want to get a decent camera and learn to use it. On Saturday I went to my first real auction, complete with auctioneer. It was a police bike auction that takes place once a month. I only just discovered that this takes place a few blocks from my house and it’s a good thing that I didn’t know this sooner, as my garage would be much more crammed with bikes than it already is. The bikes were in several large piles and although you were allowed to look at them in advance it was a little hard to see real details without being able to pull them out. Nevertheless, I spotted this bike and waited for it to show up during the auction. It was a long wait. The auction was outdoors and it was raining. The auctioneer stood on a beat-up old table in the rain and did his thing. At one point a 15 year old kid made the classic auction mistake of accidentally signalling a bid and the auctioneer made fun of him . The bikes were pulled out from the different piles seemingly at random and auctioned off. When this bike finally emerged from the pile I had been waiting for about 50 minutes. The bidding was swift and mostly uncontested and $40.00 later I had a bike. What did I get? 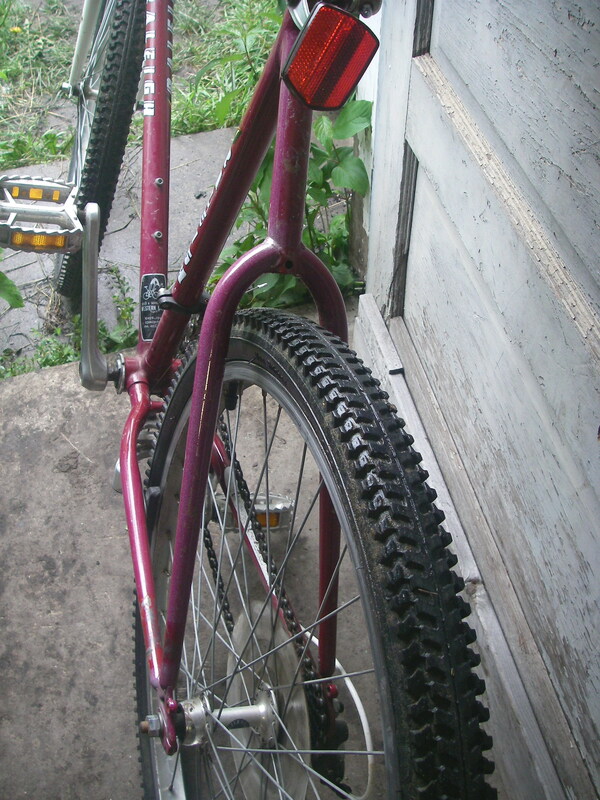 A lugged, steel framed bike with alloy rims and some OK components. 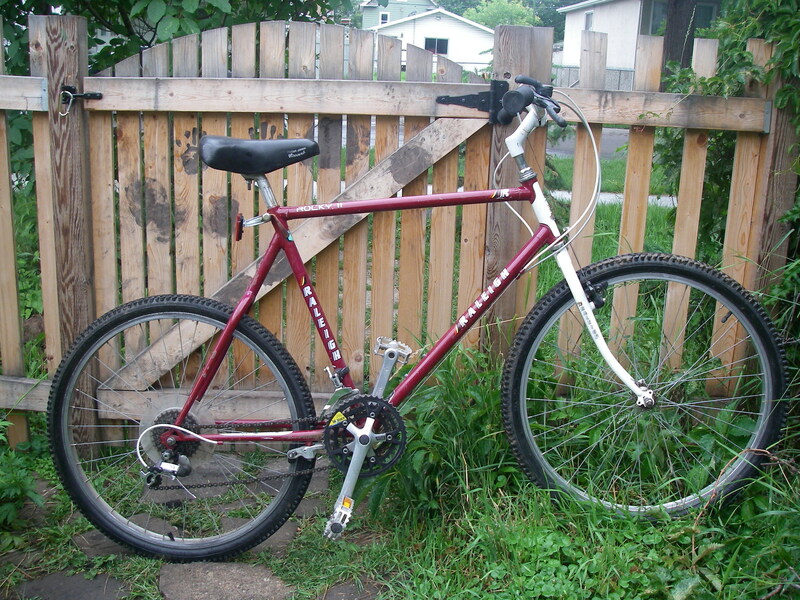 Though the sticker says “Tange” it’s no lightweight (probably it is a mix of Tange and Hi-Ten).The serial number tells me that this frame was made here in Canada in March, 1989. 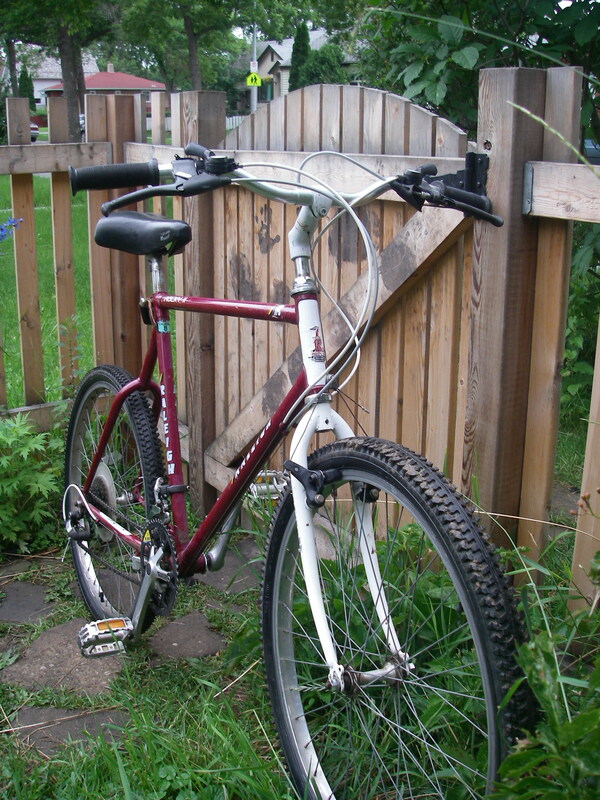 This was probably a good but not spectacular bike back in the day.I was particularly curious to try out the biopace chainrings and rear u-brake as I have never had these on a bike before. I have to say that I don’t really notice much difference with the Biopace as yet and the u-brake seems to work just fine. 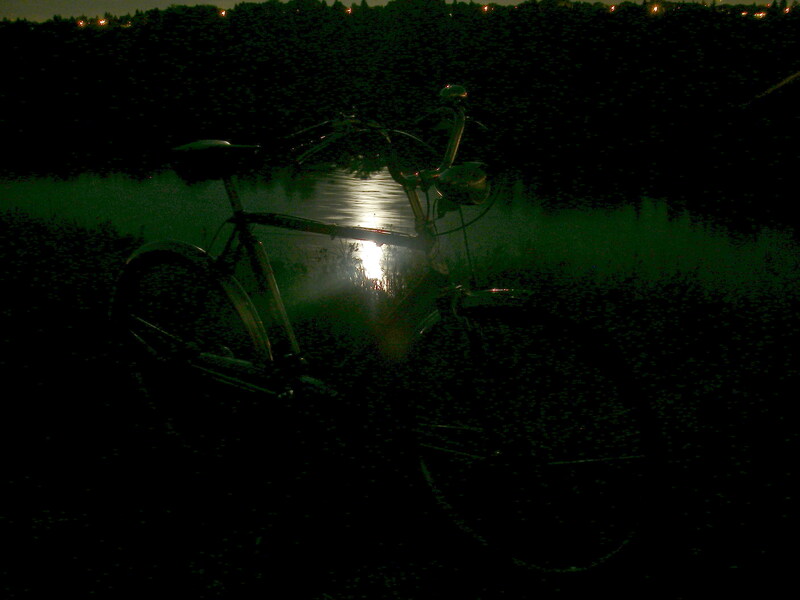 On Sunday night I took the bike for a midnight run through city streets and down some muddy trails into the river valley (challenging the illumination of my feeble headlamp a tad). It was a solid ride, and lots of fun. It handles well, stops quick and fits me nicely. This bike has once again caused me to ruminate on the subject of inexpensive bikes. 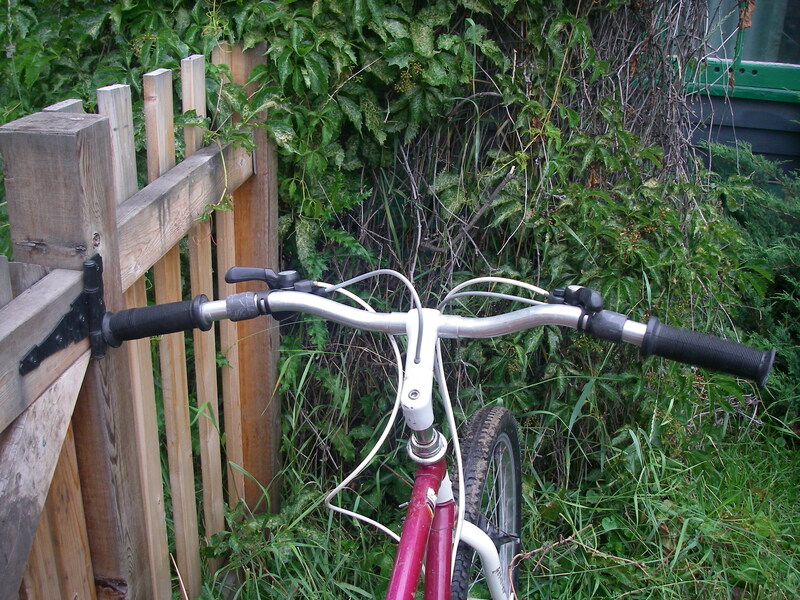 My 2008 Kona Jake, my main commuter, second hand cost me 16 times as much as this bike. Is it 16 times better? Maybe. I do know that I worry a lot more about the Jake being stolen than I will with this one. And this leads me to think that a month from now I’ll likely be a the police auction again, cash in hand. Maybe the picture doesn't show it clearly, but these are some very wide bars. I'm not so keen on the stem. 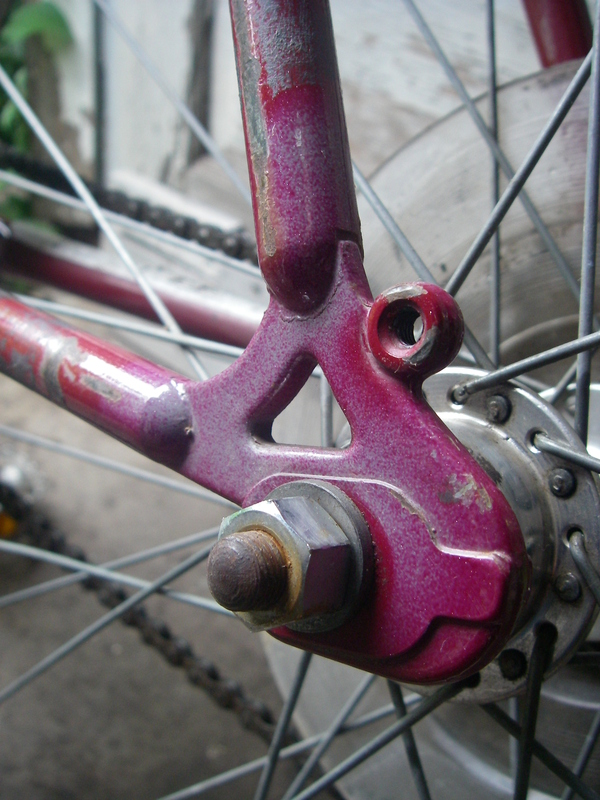 Front dropout. Defintely stamped. I think the little wheel retaining gizmo is neat. A deceptive label. 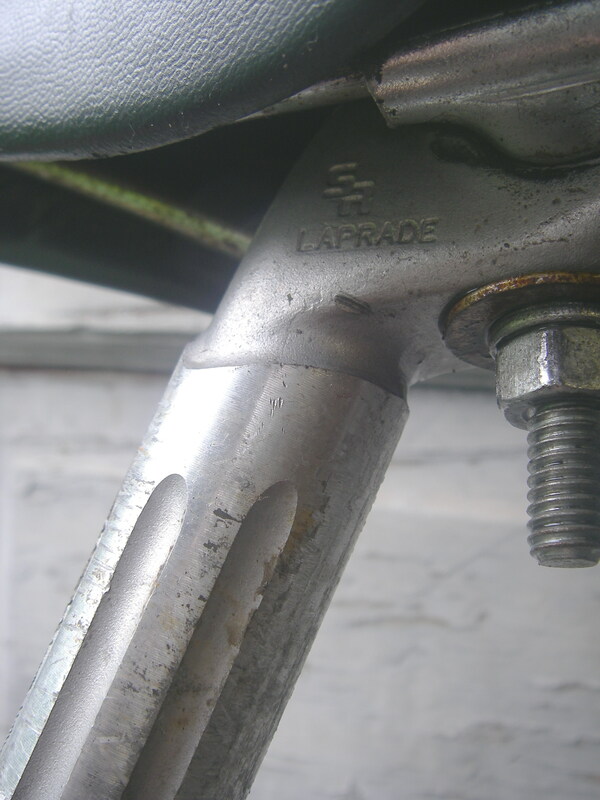 Likely ONLY the seat tube is Tange. 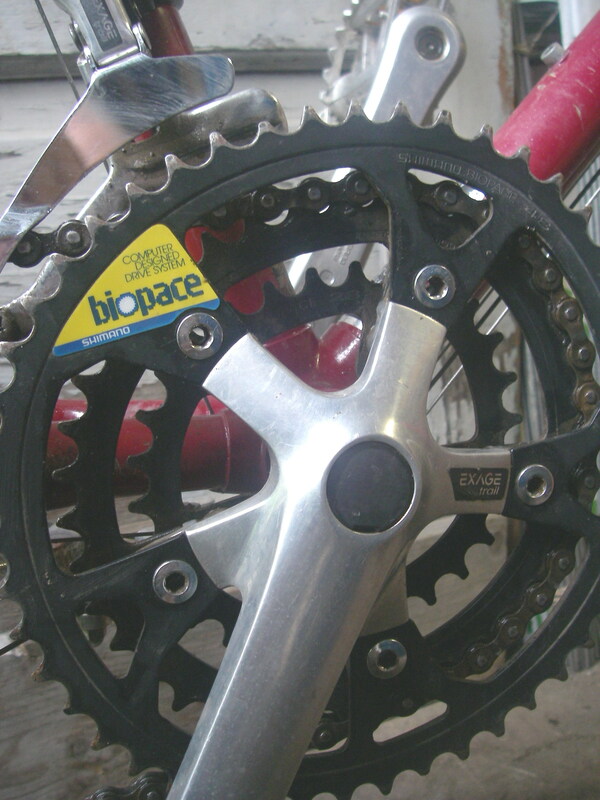 If I don't like the Biopace rings I guess I can part out the cranks. 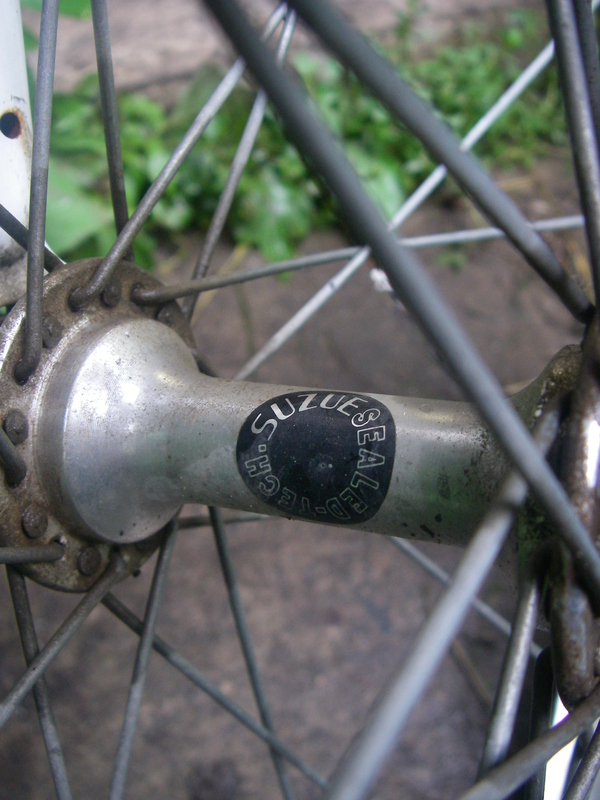 I think these Suzue hubs just have seals to keep stuff out unlike the ones on my '83 Nishik that are actual cartridge bearings. Nice seat post. And it isn't stuck! Oops. How do I mount a rack other than a seatpost one? The City crews have painted the lines for the new 97th street bike route. I haven’t had a chance to ride the part of the route with the dedicated bike lane but I am hopeful that it is a good way to travel to the South end of the city. 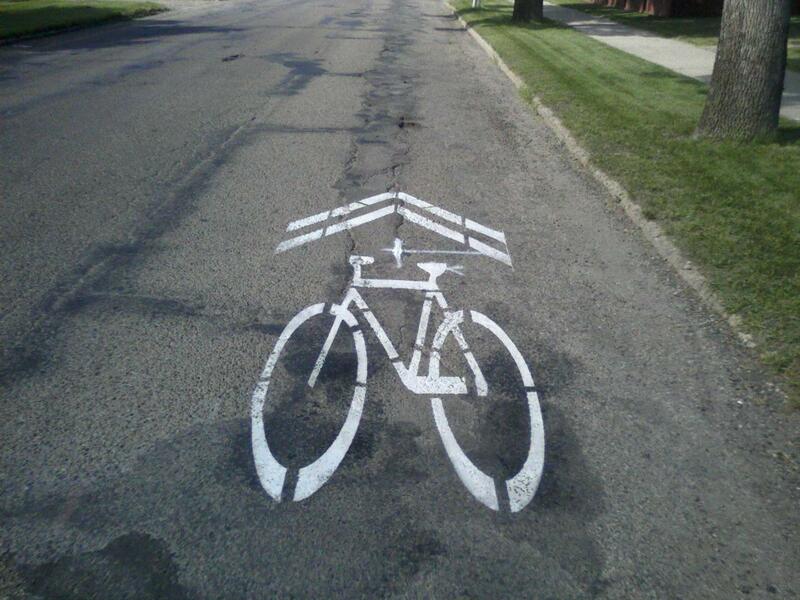 It’s nice to see any little thing done to aid the urban cyclist. My workplace is right on the route and although it may be my imagination I think I have observed an increase in bike traffic already. The part of the route that I do use on my daily commute is the segment through the residential neighbourhood between 82nd Ave and 63rd Ave. There is no separate lane here, just something that the city calls “Sharrows” in its literature. This may be one of the most inane names I have heard in a while. These share arrows aren’t going to change my use of this route in any way. I’m not really sure if they are useful at all. Perhaps they comfort the novice cyclist. Maybe they will remind drivers that cyclists have a right to be on the road. The pavement in this segment of the route is in pretty bad shape, the worst on my commute actually. When I heard about the new bike route I was wondering how they’d manage to paint the lines on such an uneven surface. 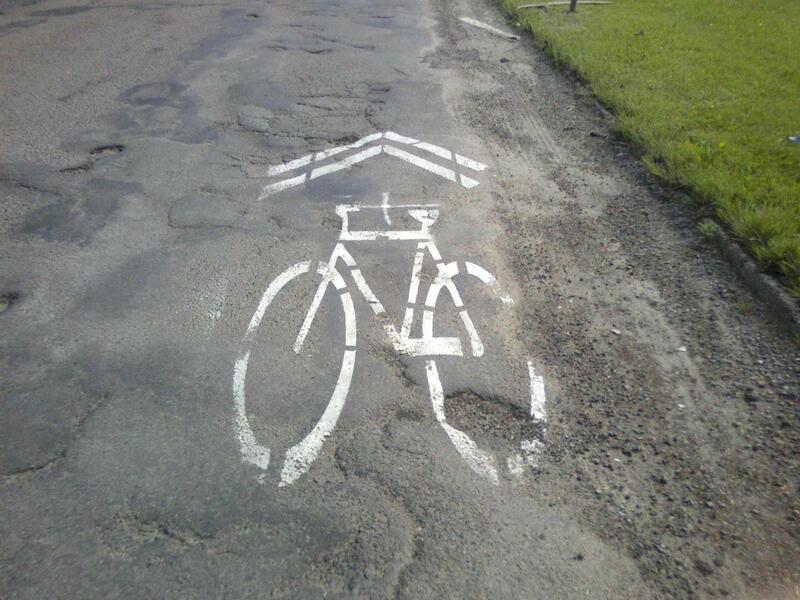 Maybe they would do some road repair and THEN paint the lines. Nope. Maybe I’m just being cranky but I’m annoyed that the new official bike route is on a road that is in such bad repair. I particularly like how the arrow points directly at a pothole. It's a good thing these arrows are just suggestions on where to ride.